Henry Bacon, architect from North Carolina and designer of the Lincoln Memorial, is buried in Oakdale Cemetery. The grave marker is a tall, narrow and smooth marble stele with an ornate scallop or palmate decoration at the top. The marker is inscribed in memory of Bacon and his wife. A larger marker dedicated to the Bacon family sits a number of feet away in the family plot. This marker is a narrow marble stele with neo-classical elements. The top of the stele is capped with the gable of a roman temple, and a laurel leaf wreath in bas-relief appears just above the inscription. 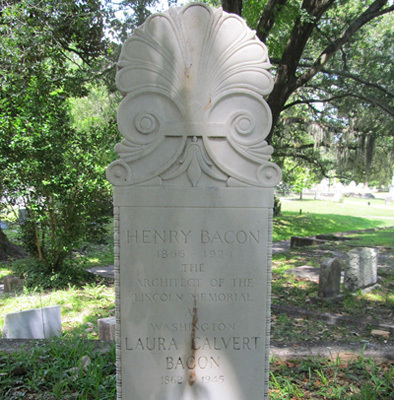 The family marker was dedicated in 1919, and Bacon's own grave marker was dedicated at his death in 1924. Henry Bacon was the architect and designer of the Lincoln Memorial in Washington, DC. He also participated in the design of two well-known North Carolina monuments, the Monument to North Carolina Women of the Confederacy in Raleigh and the 1924 Confederate Monument (also known as the Boney Monument) on South 3rd Street in Wilmington. Bacon was born in Watseka, Illinois in 1866, but spent his youth and formative years in Wilmington. He designed a number of homes in Wilmington during his professional career as an architect. The design of his marker was taken from drawings found in his desk following his death, and the family marker was commissioned by Bacon in 1919 from his own design. The memorial is located at Oakdale Cemetery, 520 North 15th Street Wilmington, NC 28401. It stands in Section D; Lot # 20. 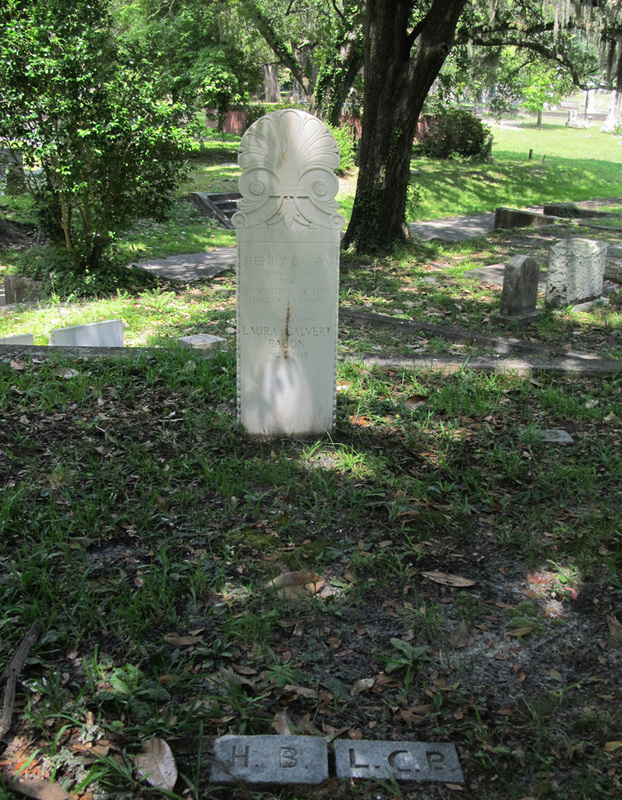 The Confederate Soldiers Monument is in the middle of Section K.
The grave and family marker sit in the grass and moss of a shaded area of the cemetery.